I’d like to write today about the magnificent Fire & Stone restaurant, which I think makes the best pizzas I’ve eaten out in London. Fire & Stone is a mini-chain (there are four or five of them in England), and we visited the Covent Garden branch on Saturday for my Dad’s birthday, after seeing The 39 Steps at the Criterion Theatre (brilliant show – incredible funny). The menu is split up into different geographical locations, which I think were Europe, USA, Africa, Australia and Asia. My parents both went for the New York pizza, which can be seen in the photo above. It consisted of smoked bacon, garlic & rosemary roast potatoes and caramelised onion jam, topped with sour cream and smoked paprika on a mozzarella and tomato base. I didn’t taste it, but I’m told that the onion jam in particular was amazing. My sister had the San Sebastian (no pic, I’m afraid), which had the same garlic & rosemary roast potatoes with chorizo and peppers. This one I did try, and it was superb, all on a tomato base. This is the Casablanca. I had real trouble choosing a pizza, but in the end the fact that this was made with a mascarpone base swung it for me. I love white pizzas, which I think I spoke about before. 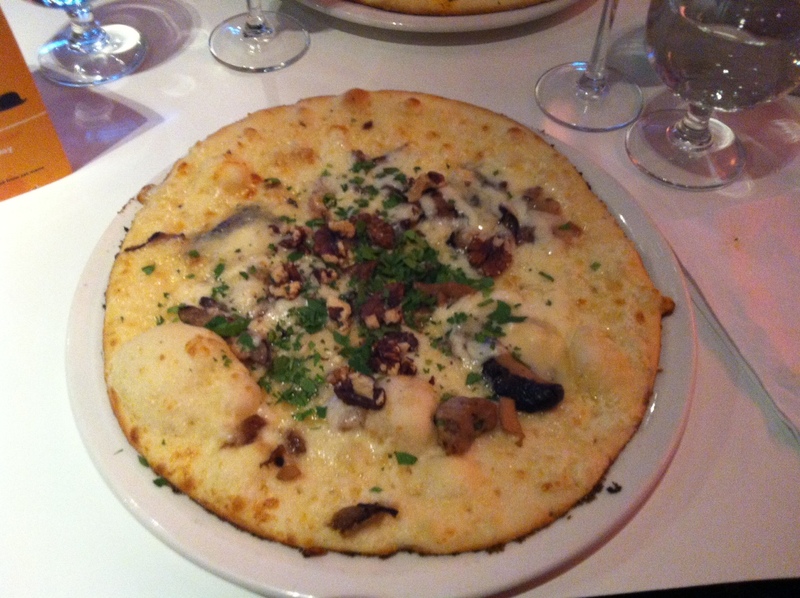 This one was topped with sautéed wild mushrooms, toasted walnuts and Roquefort cheese. There was so much blue cheese on this pizza, and the weird thing is that you can’t really see it. It’s almost like the pizza is infused with blue cheese. Hey, now THAT’S an idea! Oh, I also had a starter. 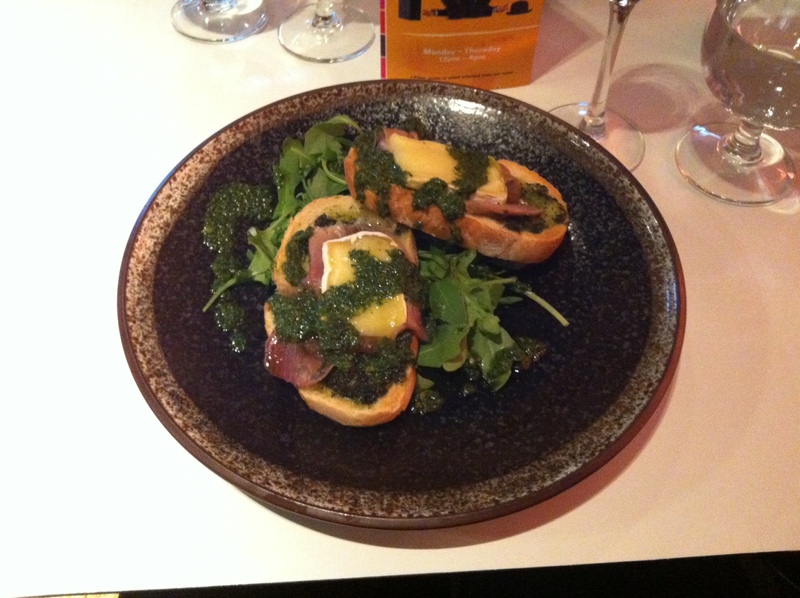 Toasted bruschetta with Parma ham and brie, covered in pesto. Absolutely delicious. That’s in the picture below. 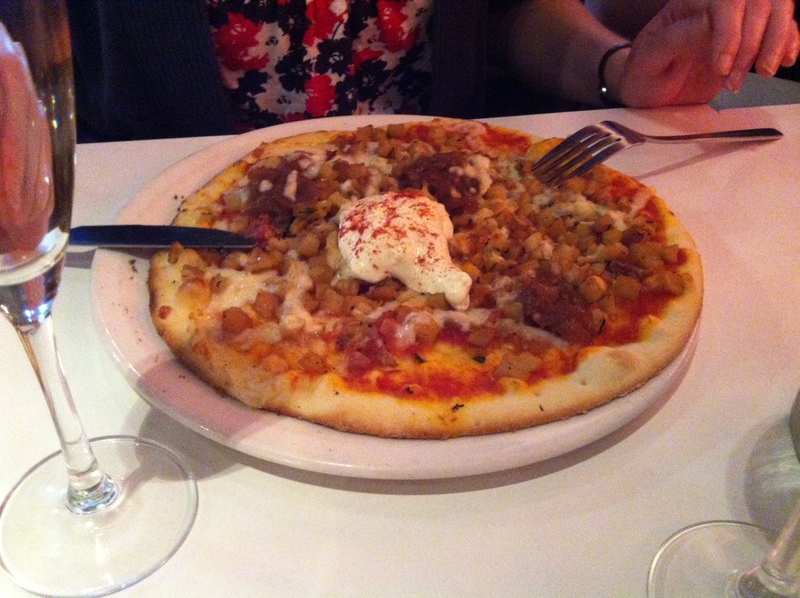 There’s not much to say about the restaurant – it’s as good as it’s pizzas! The staff were friendly, and we had booked, so I can’t really talk about getting a table, though it was very busy. The website, which has plenty of pizzas to drool over, is here, and if you’re in London go and have a pizza! They really are! Hoping to go back on Friday and try something completely different! Now if reading/seeing THAT doesn’t make one hungry, I don’t know what will! My mouth is watering!! Especially from the appetizer and the casablanca! Yummmm! The pesto was so nice – far less acidic than the shop bought stuff; it was almost sweet! Oh my, that looks AMAZING. I wish I were in London right now! Stupid Atlantic Ocean! It really gets in the way, doesn’t it? If it weren’t for the Atlantic I could have snapple every day! I love snapple!